I’m in love with this Tadashi Soji Silk Organza Gown. It’s soft, romantic and gauzy. 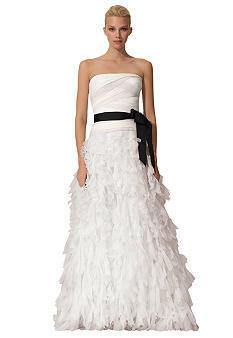 If I were to get married tomorrow, I would want to walk down the aisle in something like this (minus the black ribbon). I’m over dresses that are super structured. This dress makes me want to fall in love. It’s beautiful in champagne too.